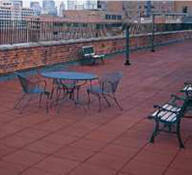 Rooftop/Walkway Patio Paver Tiles Ideal for high-traffic roofs, rooftop patios, condo patios, these walkway pads are a safe, durable solution for any area. Environmentally friendly and are made in the USA from durable recycled tire rubber, providing excellent resistance to sever wind/weather, as well as damaging UV rays. Easy to install, by either adhering to a base, bonded side to side, or loose-laid. Leaves no standing water, due to the 1¾" drainage grooves. Specs: Size 24" x 24", Thickness 1", Colors are black, terra cotta, forest green, and gray.